Provides a basic overview of bar admissions and information on the different tests. Interactive map which allows user to look up bar admissions information for each state. Requirements for all U.S. state jurisdictions. The National Conference of Bar Examiners is a not-for-profit corporation founded in 1931. It provides standardized examinations of uniform and high quality for the testing of applicants for admission to the practice of law. The Office of Bar Admissions is the administrative arm of the Supreme Court of Georgia responsible for the admission of attorneys to the practice of law in Georgia. 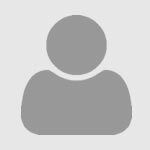 Overview of bar application process, bar exam study tips, and practical information for test day. It also provides guidelines for selecting a particular bar prep course, how to manage the material you cover, and how to learn the law so you can remember it on exam day. This book includes sample bar exam questions, as well as other useful information, such as: examples of daily and monthly schedules; listings of bar admission information for the states and territories; and evaluations of selected bar review courses. 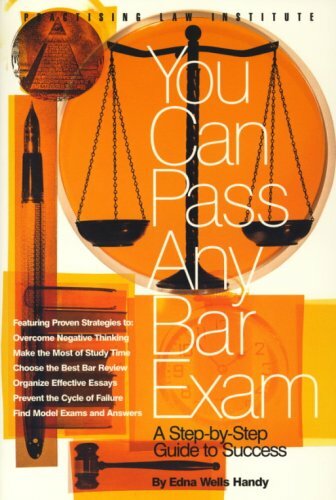 This book provides a good overview of the pre-bar review, bar review, and the exam process. Readers will gain a better knowledge of the bar exam process and learn the steps they need to follow to succeed on the exam. 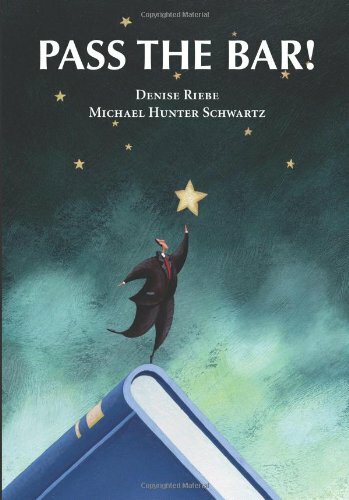 This book is a fun legal study aid or law school preparatory text that surveys about 35 legal movies, focusing on the substantive areas of law and legal issues that the movies raise. Packed with black letter law, statutory material, court cases, ethical rules, evidence rules, civil and criminal procedure rules, and dozens of law school and bar exam tips, this book is a must-read for any law student, pre-law or related undergraduate degree candidate, paralegal student, or bar exam candidate. 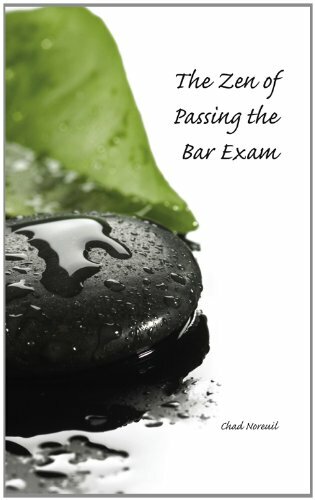 The Zen of Passing the Bar Exam offers a comprehensive approach to studying for (and passing) the bar exam, drawing a parallel between how one should approach the bar exam, and how Zen principles teach one to approach life. Richard Cabrera, Working to Improve: A Plan of Action for Improving the Bar Exam Pass Rate, 27 WM. MITCHELL L. REV. 1169, 1180 (2000). Comm'n on Bar Admission & Richard A. White, AALS Survey of Law Schools on Programs and Courses Designed to Enhance Bar Examination Performance, 52 J. LEGAL EDUC. 453, 454 (2002). Andrea A. Curcio, A Better Bar: Why and How the Existing Bar Exam Should Change, 81 NEB. L. REV. 363, 391 (2002). For those who intend to work while studying for the bar exam, the following are sources that do discuss tips for balancing work and bar prep. Thinking About Working While Studying For The Bar? You Must Read This! GSU provides students access to several sets of digital study aids available online. Bar prep is a topic covered by the several of the aids. Acing the Bar Exam provides candidates with a complete guide to the bar exam — from pre-planning considerations through bar review and sitting for the exam. It features comprehensive coverage of the Uniform Bar Exam, including an explanation of each component and how to prepare for it. Every aspect of the process is explained in detail and by example. The bar exam is de-constructed, section by section, where candidates are led through the steps they need to follow to succeed. Approaches for learning the black letter law, setting study schedules, and answering essay and multiple-choice questions are combined to maximize the likelihood of success. Each of these tasks is then configured into checklist format to help candidates navigate each step. This approach puts the candidate in control of the bar exam and not the other way around. This book presents a method for teaching students to pass the bar that is easy to learn and implement. Topics covered include learning to study actively rather than passively; choosing study partners who will help, not hinder, your studying; learning to think, read, and write critically; dissecting multistate exam questions; coping with pressure; making the most of the weeks before the bar exam; and preparing for the day of the exam. Based on the premises that the bar exam essay is often different in style, length, and scoring from the law school exam essay and that organization and issue identification can best be achieved by a structured, strategic approach rather than "winging it," this book uses frameworks as a guide to writing a top-notch essay. The opportunity to practice techniques allows students to further improve their writing.